Sao Paulo - Lewis Hamilton, who has already clinched a fourth world title, topped the times in a dominant Mercedes one-two in Friday's opening free practise for this weekend's Brazilian Grand Prix. The 32-year-old Briton made light of a cold, following his recent trek on Machu Picchu in Peru, and allegations of tax avoidance to wind up fastest ahead of his Mercedes team-mate Finn Valtteri Bottas. Another Finn Ferrari's Kimi Raikkonen was third quickest ahead of Dutchman Max Verstappen and his Red Bull team-mate Australian Daniel Ricciardo with four-time champion German Sebastian Vettel sixth in the second Ferrari. 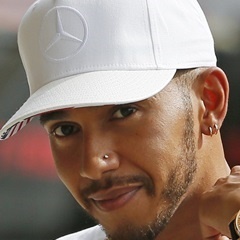 Hamilton's best lap in one minute and 9.202 seconds lifted him a tenth clear of Bottas who is seeking to close a 15-points deficit on Vettel and beat him to runners-up spot in the title race. Hamilton wrapped up his fourth title at the Mexican Grand Prix, won by Verstappen, on October 29. Retirement-bound local hero Brazilian Felipe Massa was seventh in his final home event with Williams ahead of Belgian Stoffel Vandoorne of McLaren-Honda. Frenchman Esteban Ocon was ninth for Force India and two-time champion Spaniard Fernando Alonso 10th in the second McLaren. The session, run in dry and warm conditions, was largely incident free after an early engine failure saw New Zealander Brendon Hartley forced to pull up in his Renault-powered Toro Rosso and a spin for Vettel.